(Note: I realize that many were left out but I could only include ten. I chose the ones that were repeated the most often). Witchiepoo. A green meanie, Witchiepoo lures innocent Jimmy and his talking flute Freddie to the crazy Living Island in order to get her hands on Jimmy’s instrument (His flute! It’s a family show!). Unfortunately, she is thwarted at every turn. Witchiepoo was the embodiment of the bumbling, broomstick-flying, nasty witches we all learned to fear as children. Although it only ran for 17 episodes it was very popular in its day, freaking out an entire generation of kids. 9. Disney’s Snow White and the Seven Dwarfs - One of Disney’s first, full-length animated classics, this movie features an evil queen who wields dark, magical powers. When the queen learns from her magic mirror that she is in danger of losing her title as ‘the fairest in the land’ she goes to great lengths to ensure that this doesn’t happen. No one who has ever seen this film will forget the image of the evil queen in the guise of an old woman, handing Snow White a red poisoned apple. For this reason it made my list. 8. Sabrina the Teenaged Witch - Originally a comic book in the 60’s and 70’s, Sabrina was resurrected in the mid 90’s as a television series. The plot was simple, Sabrina, a half-witch living with her two witchy aunts, discovers on her 16th birthday that she too has magical powers. Of course, being new to the world of witchcraft, her spells don’t always turn out like she planned. Sabrina made my list because she was fun and fashionable and her heart was always in the right place even when her spells were not. 7. Hocus Pocus - This early 90’s flick didn't do well with critics but gained a big following once it was released on VHS and aired on cable channels. The story chronicles three naughty witches, the Sanderson sisters, who are resurrected from the dead and must use their witchcraft to siphon the life force from children in order to stay alive. The film has a dark theme but thanks to Bette Midler and Sarah Jessica Parker, has many fun and zany moments that lend to its charm. Besides, good eventually prevails in the movie, but it’s very entertaining to see how it plays out. 6. Charmed - In the late 90’s and into the mid 2000’s we got to know Piper, Phoebe, Prue (and later Paige) Halliwell, otherwise known as the Charmed Ones. These gals had some awe-inspiring magic and with help from their Book of Shadows, continued to grow in power. What I loved about the show was that it focused on the three sisters trying to maintain a normal life including dating and family dramas while protecting the innocent from things that go bump in the night. 5. Bell, Book and Candle - No witchy list is complete without this 1958 classic. The film focuses on witchy Gillian who falls in love (of course) with a mortal man and, because of this, is in danger of losing her magical powers. I loved this movie because the chemistry between free-spirited Gillian (Kim Novak) and Shep (James Stewart) is as bubbly and delicious as a fine glass of witches brew. Plus, it’s a classic and one of the first witchy movies my mother introduced me to. You can never go wrong with a classic. 4. Practical Magic - So, confession here. This is probably my all-time favorite witchy movie. BUT, not everyone I queried agreed. The plot follows two sisters, Sally and Gillian Owens, who live with their eccentric witchy aunts on Maria’s Island. The family has been cursed and no man can ever love an Owens woman without dying at a young age. The plot sounds tragic, and at times it, but it’s also sweet, and poignant, and hilarious. And very romantic. Don’t wait for Halloween to watch this movie. It’s great any time of the year. 3. The Harry Potter Series - I originally forgot to include Hermione Granger from the Harry Potter films. When I think Harry Potter, I think wizards, but as I’ve been thoroughly reprimanded and reminded by all my Hogwarts loving friends, Hermione Granger is a witch, and a powerful one at that. I don’t have to list all the great things about this series. It’s a fantastic, magical world that you can get lost in for hours. The characters are interesting and well-developed, and they grow up in many ways along their journey. Though Harry is the star of the show our little witch Hermione holds her own with a quick wit and a quick wand. Plus, she’s super cute and someone we want to root for. 2.The Wizard of Oz - We all know the story: small town girl gets tossed by a tornado into the magical world of Oz. There, she meets Glinda the Good Witch and The Wicked Witch of the West. She also inadvertently knocks off the Wicked Witch of the East in the process. The movie is great in so many ways: amazing song and dances sequences, brilliant use of Technicolor, and unforgettable characters. The real charm of the movie, however, lies in it’s simple storyline: the pure heart of one little girl is more powerful than any magic a witch can do. 1. 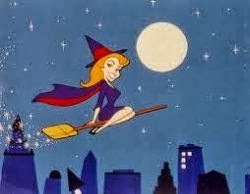 Bewitched - Every person I asked mentioned the 1960’s sitcom, Bewitched. Samantha Stephens is a lovely young witch who loves her dull husband so much that she is willing to give up her magical powers in order to please him. This includes doing her housework like (egads!) a normal woman. (Ladies, it’s not worth it! The only thing cowing to a man ever got poor Samantha was an even duller doppelganger version of her husband who appeared in the sixth season). Of course, Samantha’s nosy neighbor, her disapproving mother, and her practical joke playing uncle add drama and hilarity to the mix. This is one of the most beloved witchy shows ever made and in 2002 was listed in TV Guide’s 50 Greatest TV Shows of All Time. To this day, whenever I catch an old rerun on TV, I have to revisit Samantha and her zany family. It just feels like home.